59% of Democrats described themselves as “angry” ahead of the midterms, up 10 points since June and nearly double the share of Republicans. Three in four Democrats and 6 in 10 Republicans describe the midterms as “more important” than past elections. Common wisdom among political experts and the cable news chattering class is that Republicans will suffer losses in the House and hold their ground in the Senate after the ballots are counted in the midterms on Tuesday. And Democratic voters seem to have imbibed the prevailing view: according to the latest Morning Consult/Politico polling, they are more likely than Republicans to say their party will win the House, but fewer Democrats now expect to win the Senate. 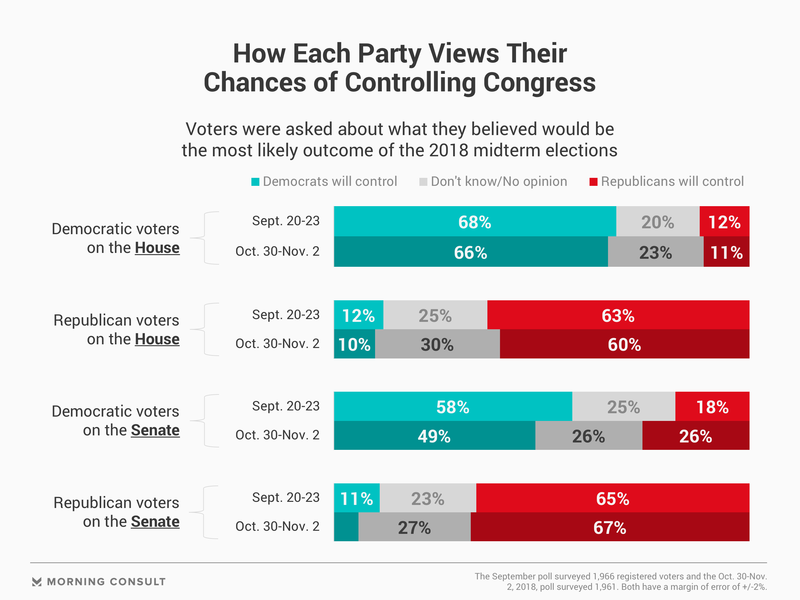 The Oct. 30-Nov. 2 poll found two-thirds of Democrats say their party will take control of the House, largely in line with a poll from Sept. 20-23. In the same two polls, the share of Democratic voters who said the party would take control of the Senate fell 9 percentage points to 49 percent. Among Republicans, the numbers were about the same in both polls, with 60 percent now predicting a victory for the GOP in the House and 67 percent predicting one in the Senate. Overall, voters are split at 35 percent each over which party will control the House. The poll, which surveyed 1,961 registered voters and has a margin of error of 2 percentage points, found a 46 percent plurality of voters believe Republicans will control the Senate. Democrats need to win 24 seats held by Republicans and hold the 194 seats they already have in order to take control of the House. Twenty-five of the competitive races have played out in places Democrat Hillary Clinton won in 2016; and in the contests that are rated “toss-ups,” President Donald Trump is not popular, according to the Morning Consult Midterm Wave Watcher. In the Senate, Democrats need to add two seats and hold the seats they currently have, a tough feat that puts the party on defense in several states where Trump won in 2016 and remains popular, according to the data. With predictions of a close race, more Democrats reported stronger feelings about the elections than they did five months ago. The share of Democrats who said they were “interested” in the midterms rose 11 points since June, to 81 percent, higher than the 73 percent of Republicans who said the same. Fifty-nine percent of Democrats described themselves as “angry” ahead of the midterms, up 10 points since June and nearly double the 30 percent of Republicans who said the same. More Democrats also said they were both confident (up 8 points) and worried (up 5 points) about the race. 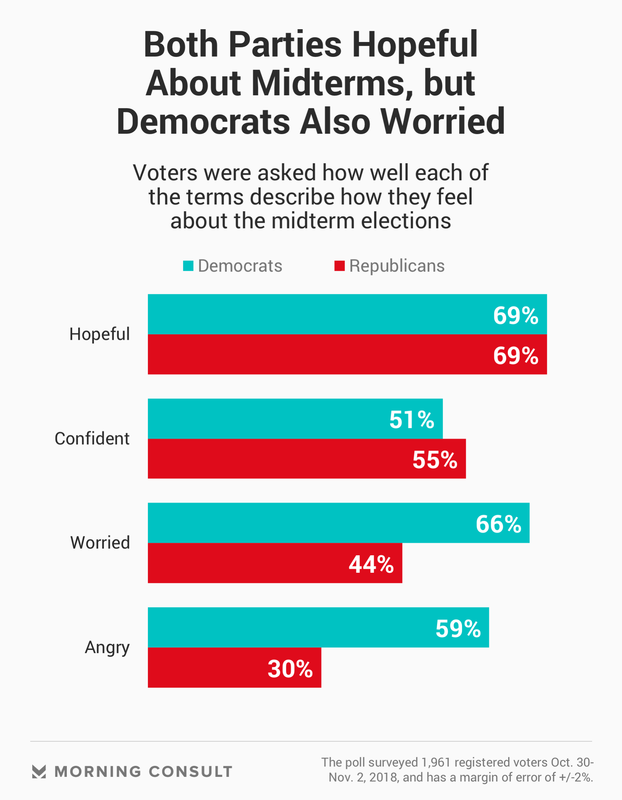 More GOP voters also said they were worried (up 7 points), while the share of confident Republican voters fell 6 points. Strong feelings may be tied to just how important voters view this race: Three in four Democrats and 6 in 10 Republicans describe the midterms as “more important” than past elections. But the stakes are even higher for Democratic women, who are 16 points more likely than Republican women (73 percent to 57 percent) to describe the election as more important than past contests.